Warcraft IV probably isn't coming for a while, so one fan decided he'd just build it himself. Blizzard games are pretty consistently great, but the Blizz sure does take its time releasing them. Most of us have come to accept the long wait between games, but not long-time modder StevenLuo. No, he decided that if an official RTS sequel to Warcraft III wasn't coming anytime soon, he's just have to create it on his own time. Eight months later, he's ready to show off his work by releasing a huge mod on the Starcraft Arcade. 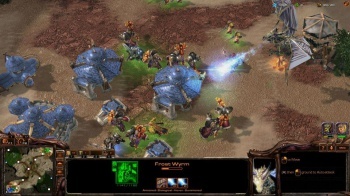 The mod, which StevenLuo dubs Warcraft: Alliance and Horde (or WAH, which is a lot more fun to yell), was built using the Starcraft II Editor with assets imported from World of Warcraft. It's a fully functional RTS, with two factions, 14 buildings, 16 units, 18 heroes, and over 50 neutral creeps. The WoW models look perfect when scaled down to a classic RTS perspective, and the MMO supplies all the units with familiar animations and gear. Heroes and grunts have abilities as they did in the Warcraft series, with many new ones pulled from memorable WoW classes like Undead Rogues, Blood Elf Paladins, and Pandaren Monks. The mod can even be played single-player with a serviceable skirmish AI. At the end of the day, this is a mod made by one guy, so don't go in expecting Blizzard levels of polish. Still, it's impressive work - and it had better be. StevenLuo worked on the mod for six months in his free time before quitting his day job and devoting all his time to the game. Not sure how wise that was financially, but he plans to continue adding content to the mod, with the next big update to feature a third faction for the Burning Legion.